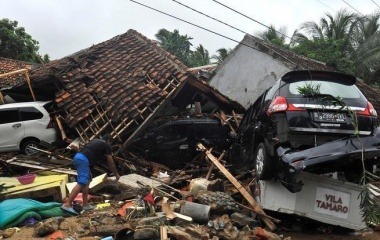 PANDEGLANG, Indonesia (Reuters) – A tsunami killed at least 222 people and injured hundreds on the Indonesian islands of Java and Sumatra following an underwater landslide believed to have been caused by the erupting Anak Krakatau volcano, officials said on Sunday. Thousands of residents were forced to evacuate to higher ground. By 5:40 p.m. (1040 GMT), the disaster agency had raised the death toll to 222, with 843 injured and 28 missing. As night fell on Sunday, rescue efforts continued but workers and ambulances were finding it difficult to reach affected areas because some roads were blocked by debris from damaged houses, overturned cars and fallen trees. Authorities warned residents and tourists in coastal areas around the Sunda Strait to stay away from beaches and a high-tide warning remained in place through until Dec. 25 as officials tried to determine the exact cause of the disaster. The western coast of Banten province in Java, Indonesia’s most populated island, was the worst-hit area, Nugroho told reporters in Yogyakarta. He also said at least 35 people were reported dead in Lampung in southern Sumatra. The Red Cross send out equipment and aid from its regional warehouse in Banten including water, tarpaulins, shovels and axes, as well as hygiene kits, it said in a statement. Television footage showed the seconds when the tsunami washed away an outdoor stage where a local rock band was performing for hundreds of guests at an end-of-year party for state utility company PLN. The tsunami was caused by “an undersea landslide resulting from volcanic activity on Anak Krakatau” and was exacerbated by abnormally high tide because of the full moon, Nugroho said. Additional reporting by Fanny Potkin, Tabita Diela, Jessica Damiana, Wilda Asmarini in Jakarta; Writing by Fergus Jensen, Kanupriya Kapoor and Lincoln Feast; Editing by Alison WilliamsOur Standards:The Thomson Reuters Trust Principles.